Weezer’s first album came out 18 years ago last month. Since then, they’ve released eight (or nine, depending on who you talk to) more, along with a plethora of b-sides and other songs that never even made it to an album. I’ve written before about the large amount of material the band has produced but never released. But there’s a whole other category of Weezer song I’ve never really written about before: those songs that never made it to an official release (album, compilation, b-side or official digital companion) that somehow ended up in the hands of the fans. Ten years ago, while working on their fourth album, Maladroit, Weezer put multiple versions of each album contender up on their Website for the fans to download. But they didn’t stop there- they also uploaded early versions of their fifth album demos (which never made it to an official release) and lead singer Rivers Cuomo shared many of his home demos with fans. The reaction to the songs being shared was mixed. Fans debated the quality of the material, but most appreciated the chance to hear the songs throughout their development. To those who became fans after the Maladroit era, many of these (and other unreleased material) remains a surprise. And that’s the point of this list, to look at a number of Weezer songs that haven’t been “officially” released but are readily available. In addition to the list above, I’m not counting Rivers’ solo demos or songs from his Boston shows (that’s what the Alone series is for). Nor am I counting early versions of songs that ended up on an album (if I were, the “doo-doo-doo-doo” Burndt Jamb and If You Want It would be on the list). Most of these songs were recorded between 2001 and 2002. That era is so heavily represented because that’s the source of most of the unreleased songs. Also, I’m relying on YouTube here, and the only available versions of these songs are from concerts, so I apologize in advance for the quality. Put up on Weezer.com sometime in April of 2002, after the Maladroit sessions, but before the album was released. It featured what seemed to be a more personal theme than anything on Maladroit and some great instrumentation. The band would revisit this song later that year, but this is the best version. From an acoustic session in the fall of 2002, released along with a version of Private Message (keep reading). The lyrics (seemingly involving choking) are a bit…different. Recorded with a slew of other songs in the summer of 2001 in Washington, DC, with Mikey on bass. Not sure what the song is about exactly, but it sounds like they’re having fun here. Weezer later attempted this during the Maladroit sessions, but it sounded differently. Yes, a demo version of this song was available on Alone II. But this version is from the summer of 2000. This was one of the first new songs played by the band after coming back from their 1998-2000 hiatus. A poor version of this was available immediately after that first show (which took forever to download back in the days of dialup). Thankfully, better versions still surfaced. I can’t find a version of the best take of this song -released along with 367, the song features the same instrumentation and real point of view. Additionally, the April ’02 version started off with a near-minute long instrumental jam. This take, from later on in the year, isn’t as good, but is still pretty decent. Weezer recorded three different versions of this oddly-named tune, in the fall and winter of 2001. One version featured Rivers singing in his normal voice. The other two, well, you can hear for yourself. I also have to mention this is Hope’s favorite Weezer song title. This goes without saying for all of the songs on this list, but I really think Weezer missed out by not putting So Low on an album. I first heard it at the Detroit show in September ’01 and got chills listening to it. The band played this a bunch of times in the fall of 2001 and then forgot about it. It resurfaced in the summer of ’02, but was changed to Mansion of Cardboard, a song about homelessness, and the magic was gone. Another one of the Summer 2000 Songs, or the first batch of Post-Pinkerton new songs. The song is energetic with a crazy (in a good way) chorus. There’s probably a better-sounding version of this out there, but it’s great to see this one being played. This is from the same acoustic session as Everybody Wants a Chance to Feel All Alone. This is actually the fourth version of this song we have (but I couldn’t find a video of my favorite, the original from April ’02). Personal lyrics and a great sound here, with the electric version featuring an energy that was only touched upon in the songs that made up Maladroit. Some would say I’m cheating here. This song is from a show Rivers performed in Boston in January of 1998. However, bandmate Pat Wilson played the drums at this show. Additionally, the band would attempt this song in the spring of ’98 as they tried to get their third album off the ground. This was one of those songs Rivers wrote as a reaction to Pinkerton, a quasi-romantic repetitive song with lyrics that were poetic, but not personal. I’m not sure what this song is about (some interpretations of the lyrics are downright creepy), but I love it. As I mentioned, most of these were released around 2002 and were recorded during an era where the band shared everything. Even with what we have, there are a number of good songs that didn’t make the list. While they don’t share as much anymore, they have opened up the vaults slightly. Other bands are using digital distribution streams to make money off their unreleased songs. If Weezer ever does the same, I might as well just send them my paychecks directly. Tonight, I was tested as a parent like never before. Recently, during dinnertime, Hope has finished eating much quicker than The Civee or I. And she repeatedly lets us know she’s finished. Sometimes she will sit with us as we eat, but many nights, she wants to get out of her chair and play, often asking for us to leave the table and play with her. The Civee and I usually don’t give in. We’re fine letting her down early, but it’s our goal to finish our meal, hopefully impressing upon her the idea that as a family, we sit together until everyone is done eating. I should probably also mention that one of her favorite commands is “come,” and she will say this as she reaches for our hands to take us somewhere to show us something or to play with us. She went away and came back after a few moments. Still with a big smile on her face, she looked up at me; “Daddy…come.” This started to weaken my resolve. The Civee and I had always taught her to refer to us as Mama and Dada. I don’t know where she got it from, but within the last week, she’s started calling me Daddy instead of Dada, and it just sounds so cute. But still, I stayed seated and continued my meal. She started to cry. Which made me want to cry. All because I’m trying to teach her a lesson. We’ve had a great weekend so far, spending a lot of time playing and even taking a trip to COSI while The Civee studied. There will most likely be a time in the future when she won’t want to hang out or want my attention as much as she does now. And as tough as it may be to believe, she may not always want to watch Weezer videos with me. Still, she does have to learn about mealtime. And I can’t give her the idea that I’m putty in her hands. It’s tough, but I’d like to think that what I did tonight was good for both of us. It was a rainy day and The Civee and I had to do something with Hope this afternoon. We decided to take her to a movie. We went to see The Muppets. It was age appropriate for her, The Civee and I wouldn’t be totally bored and Hope is familiar with the Muppets from Weezer’s Keep Fishin’ video (Weezer has a surprising number of kid-friendly videos). We were concerned that we wouldn’t be able to last the whole movie. Hope gets vocal and likes to move around a lot, but we were willing to try. The theater wasn’t that crowded, so we got seats near the aisle. There were a number of trailers and a Toy Story short before the movie started. Hope seemed to get the idea of watching what was going on on the big screen, although she often stood on her seat and talked (asking for more popcorn, mostly). We did have to take her for a walk a few times and she got real antsy towards the end (damn those previews and the short feature!). But overall, she enjoyed the experience. The Civee and I liked the movie. And I’m glad to know what happened to the world’s supply of New Coke. I first got Weezer’s The Blue Album sometime in December of 1994. I was already a fan, having heard and enjoyed both Undone and Buddy Holly earlier that fall. But listening to the CD was an eye (or ear) opening experience. Opener My Name Is Jonas was a solid melodic rocker. The second song on the album was even better. No One Else sounded like the perfect rock song. At first listen, I knew an album with songs like this, Buddy Holly and Undone was special. And I was right- the rest of the album was great. All these years later, No One Else is still electrifying. Unfortunately no recording has turned up for this show, which was in my opinion , a turning point for the band. They played tighter than ever before, had a better sound, and (after internal debate) debuted “No One Else”, a song that started to steer the band in a previously invisible direction. A few years back, I e-mailed Karl to ask what he meant about the debate and new direction. Karl replied; “Rather than sticking with a heavy Pixies-influenced sound, “No One Else” was one of the first songs to have the band wondering whether they were going in a “‘pop’, [or] too ‘commericial’ sounding” direction. It is easy to see a slight Pixies influence (and a much heavier one in the band’s earliest demos) in Weezer’s material. 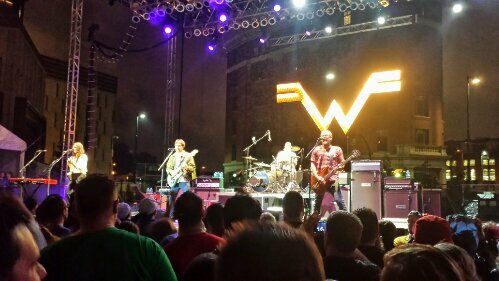 But while that influence is still there, Weezer is much more melodic and pop-friendly than the Pixies. No One Else was played regularly by the band through 2002. My favorite live version of it comes from the summer of 2000, where for a few shows, they began the song with an extended intro. I was lucky enough to be at one of those performances and later get a recording. Even though the quality is suspect, you still get an idea of the intro in from this recording of the Cleveland ’00 show. No One Else was eventually shuffled out of the band’s playlists in favor of singles and more current songs (although it has enjoyed a bit of a comeback during the Memories Tour). Even though it’s no longer in the band’s current repertoire, it’s nice to know they made the right choice all those years ago on September 15 at the Teaszer. Even though most of our music is on our computer, The Civee and I still have a shelf of CDs in our dining room. The other day, Hope and I were playing when she went over to the CD case. I told her to pick one out, so she took CD and started waving it around to no one in particular. This proves a hunch I’ve had for a long time: Hope’s a Troublemaker. And to those (namely, Hope’s mom) who would say this picture is staged, don’t you think I would have gotten a better shot of her face? Either way, I’m very proud of her choice. I have a feeling The Civee is not.